Polyurethane Injections were performed to stabilize the curled concrete slabs. 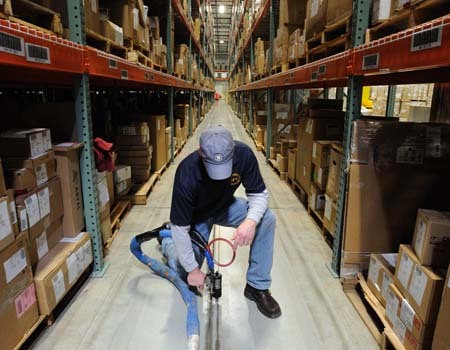 The work took place during night hours and did not interrupt the busy distribution warehouse. Work took place in confined areas as shown here. The polyurethane foam was successfully injected within the limited working area. Problem: Four acres of concrete slabs experienced a phenomenon known as slab curling. The concrete slabs effectively curled upwards and were cracking and deteriorating from heavy forklift traffic. The warehouse contained an existing distribution business and could not be impacted by the repair work. Solution: Polyurethane foam injections were utilized to stabilize the concrete slabs. A specialty structural polyurethane foam was injected at the curled expansion joints, effectively stabilizing the slab from further damage from heavy forklift traffic. Benefit: The process greatly improved the condition of the concrete warehouse and repaired four acres of concrete in under 4 work shifts. Testimonial: "(Polyjacking) was by far the least disruptive method. Another method would have taken too long for my client. It's also a cleaner and better technology."